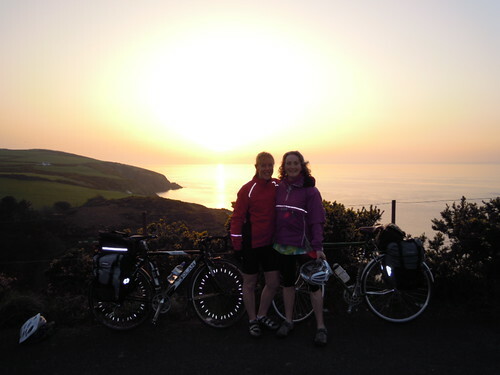 Manxcat and Tina, cycle East… and then West! The Way of the Roses, then back via Leyburn in Herriot Country. Tina and I set off in the still of morning, and as luck would have it, a runner was panting towards us and so took our first photograph of the trip. The ferry docked on time and we had had a good crossing. Weather in Morecambe was breezy but about 17 degrees C, yep as luck would have it, it was HOT! Summer oh boy oh boy Summer was here! Bikes were loaded and itching to be off. The route had been punched into my SATMAP, the only difference, was that on the 'real' Way of the Roses, there are 17 miles of off road cycling. Now, I have cycled a few of Sustrans routes, and some of them take the cyclist off road on tracks and dirt roads really more suited for a mountain bike. So, taking no chances with Hettie my road gal, I punched in the route avoiding all the off road bits. Here is the Garmin link to the route Tina and I cycled, on Tina's very first tooth cutting C2C ride from Morecambe to Flamborough Head. 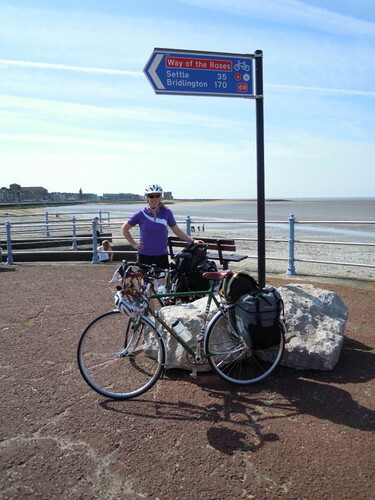 The Way of the Roses route starts at Morecambe. In retrospect the route has been nicely thought out. Stuff for every cyclist, and all of the route is along peaceful quiet lanes and roads. There is plenty to see and do if you wish to stop for longer than one night. There are lots of small villages sporting coffee/tea shops, one stop shops and attractive busy public houses for us cider drinkers. If I did this route again, I would do it as a tourist and enjoy the craft shops, the cider and the local cheeses. Tina and I though were on a mission. A mission carved out to us by Mr Time himself. We had just 4 days to complete our mission, and to get back to the Isle of Man by Wednesday. (Family commitments and work). The first part of the route, I knew quite well, as I cycle a 100km Audax from Caton in June (See Audax UK Calendar for details), which uses part of the Lancashire Cycle route (See Sustrans for details – its a nice route I did it in 2009). As there were plenty of small shops etc, there is plenty of places to keep your water bottles and anti-bonk supplies sorted. The route is not the most direct of course, as its a touring route. It meanders and criss crosses the countryside taking in the best bits and missing out the worst. Hatton Park for example was lovely to cycle though, a single tracked lane lined with sheep, who I'm sure were applauding us with their chewing jaws and flicking ears. Our first over-night was at Pateley Bridge. A distance from Heysham docks of 68 miles. Our route took us through Lancaster of course, and our first biggie town (talking market town here) was Settle. As we cycled into Settle, we past a large garage with a Co-op ideal re-fuelling stop. We arrived in Settle at about 5pm, and a hungry Tina sniffed out the fish and chip shop. Well, not kidding, they were the best fish and chips I have ever had. I am not a fan of fried battered anything, but hunger took over and they were so good, I am converted! Light batter on the fish, which was really fresh and super just ready chips too – perfect! My favourite part of the Way of the Roses route was that hill out of Settle. It was really beautiful, and you could see to the end of the world or so it looked like. Once at the top, the steep hill settled out into plateaus and dips taking us past Stump Cross Caverns looking somewhat abandoned as it was getting twilight and my bicycle lights were on. Then came the decents into Pateley Bridge... what what decents... sadly spoilt due to our late arrival. We simply dare not let the brakes go incase there were potholes or other road hazards that could spring up quickly in the darkening of the late day. The decent began as a 10% drop, then a 16% and finally a 25% dip into the market town of Pateley Bridge. Yet another beautiful Dales town. Lots to see and do. We stayed at Talbot House B&B run by Julie and Jill. Highly recommended. A very friendly, warm hearted welcome, into a large twin bedded room with a good shower and tea and coffee. One of my difficulties organising the trip, had been getting accommodation for one night over a weekend for this ride, but Talbot House welcome single night stay visitors. Well worth the stay, and price was similar to other B&B's in the area. Breakfast was HUGE, and plenty plenty of it. We were up early and off the next morning by 9am. I asked about the hills leaving Pateley Bridge, and was forewarned about them by the landladies, and another pedestrian as we left the town as well. So we walked the bikes out of the town, only to find the hills really were ok, and that we could of cycled that first bit... but one persons hill is another persons mountain I suppose. 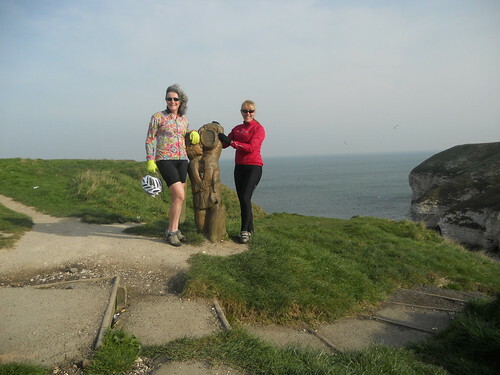 Today, we were to cycle to Flamborough Head. My husbands family are all farmers from Beverly and Bridlington areas on the East Coast, and his Aunt had been a Flamborough lass. Besides this, Flamborough was EXACTLY the furthest most easterly point directly across from Morecambe. I assumed Bridlington was the choice to end the route due to access to accommodation. 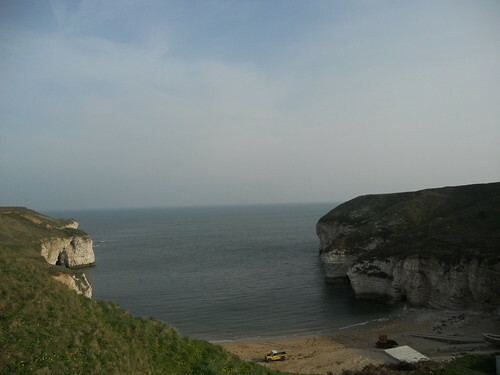 Flamborough was a very tiny place, but we were very pleased we stayed there – it was fab! This final day of cycling east, was windy. It had been predicted by XC weather, that on my days east, we would have easterly winds, and on our return we would have westeries and thats exactly how it was. So head winds every day basically. Today though, it was cooler, and so shorts were ok, but wind jackets and gloves were needed. As we cycled this route, you could not but notice the great number of Roman roads you travel along. Straight as dies, long with deep ditches dug out on either side. So well made that modern road builders still keep their basic shape. Now usually I get on very well indeed with Tina. We had had a fab ride up to now. Then suddenly something happened...... I tried 'to knock her lights out' It was 100% my fault. The lanes were pretty well all single tracked and mostly traffic free, but in the wind it was difficult to talk so we cycled a lot side by side. My attention was on a graceful glider taking to the skies, when suddenly I was aware of a car right up my mudguard and it really made me jump. In panic, I shouted 'Car, I'm in front' and in front I went, as I pulled to the left, my rear pannier (my bum has always been big, now of course its giganticous) took Tinas front wheel. She and her bike were enforced up a grassy bank and right into a sign warning folk of planes, she struck the sign with her ribs and some how managed to stay on board her bicycle and not ver back onto the road and into the path of the second car behind the first. She came to a shuddering halt. Almost in tears, certainly in shock. I felt dreadful, and still have massive gilt trip, even while typing this. So we took some pics of course! Then a really nice cyclist came by (where where they when we needed them! ), and wondered why we wanted a picture of us on a really uninteresting part of the route.. but hey ho, he obliged and took some snaps of us by the plane signage. Tina is sporting a pretty nifty bit of bruising art work on her ribs now. York was part of the route, I had re-routed. I expect the run though York is lovely and certainly I intend to cycle back to York as a tourist, but not today. We avoided the town, and I had chosen a sort of ring road, only using the lanes and again avoiding the big heavy roads. My route re-joined at Stamford Bridge, via Haxby and Upper Helmsey. Tina was getting pretty tired by now. I am a cyclist who can cycle without too much effort more than 200 miles in a week on a regular basis. My life is less complicated now, as my children are now older teenagers and almost ready to fledge into the world of real life. Tina still has young'uns and only cycles about 40 or so miles in a week, and usually all in one day too. By the time we reached Pocklington our average speed was about 9 mph. Over such flat landscapes it should of been nearer 14-16mph. Tina was very close to exhaustion and was starting to shut down. Not good news when you have nearly 30 miles left to go. Especially 30 'Mary miles' which could be anything from 25-40 at a guess. We had a rest and ate, while I had a re-think. THe big A -164 into Bridlington was just up the road. The Way of the Roses avoids this trunk road by cycling a much larger route by-passing the A-road, via Driffield. A-roads are never my choice of routes to ride upon. Noisy, busy, hot, smelly and uncomfortable cycling lay ahead, but would be over with in just about 6 miles instead of 14. Plus we were going to Flamborough, a further 7 miles. We needed to cut out some routes and make the ride more direct from this point. So here, at Kilburn, we ended our Way of the Roses ride and instead our ride evolved into a C2C route, and a Century too, as it was 102 miles in total from the start of our cycling on the IoM to our B&B in Flamborough. 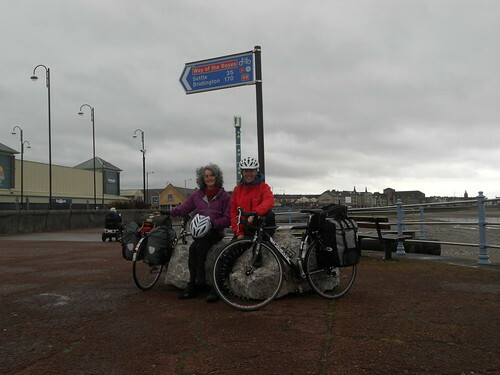 We needed to concentrate 100% on this A-road route and it was unpleasant, but in due course we arrived in Bridlington. At this point my GPS battery died after 11 hours constant use. We found the hotel in Flamborough by asking locals, and before long we were in our comfy hotel room with hot showers and a fantastic good value for money dinner. We stayed at the North Star Hotel, and would highly recommend it to cylcists wanting to go that bit further. Cycles were locked up over night inside. We had the best spread at breakfast time I have ever seen! You name it, you could of had it. Monday morning we started our ride back home. The morning was quite cold, and there was a strong westerly, that was to be a bother for Tina for the rest of our journey home. I chose this route with care, and by complete fluke, I happened to choose a particularly beautiful part of England to cycle home. There were a couple of busy bits, but all in all, I preferred my home route, from Flamborough to Morecome than the Way of the Roses route. The scenery was more stunning, the skies more beautiful and the small hamlets were as always typical Dales with their stone work. I was particularly taken by how tidy, clean and manicured this part of England looked. No sign of a recession, everything had a spanking coat of paint, and the gardens full of daffodils and neat cut grass. Even the sheep somehow looked glowing. 🙂 Sadly the head wind was against us for the rest of the journey home. I am used to weather, I cycle in all of it except ice and snow. Tina though did not like it very much. Our over night was in Leyburn, and to get there, we had to cross 'Herriot Country' for those of you who read is books. It couldnt have been better as far as I was concerned. Fantastic scenery and wonderful undulating climbs and ascents I loved the ride home. On our way home, we were amazed to come across the two ladies from Devon cycling towards Bridlington, totally off the Way of the Roses route cycling towards us, waving as they passed... We all had a mission on, and I wish in hindsight that we had pulled them over and taken their photographs. Its a small world is it not? My initial plan had been to stay at Thirsk (Darrowby in the Vet series of books), and of course a stop for the LEL (London, Edinburgh, London Audax), but instead I chose Leyburn as it was a more direct route home that missed major roads. We did have to take a detour at one point, as my OS map said 'Go this way...' but the road abruptly ended and we looked across at a HUGE dual carriage way with no access, so we had to behave like BIG traffic and use the figure 8 massive roundabouts, a hairy moment, but we made it over. Isnt it a fab picture? Tina took this one. Tina on the fence beneath the horse. Does anyone know its history? This white horse, it was featured everywhere, its image was on vans advertising stuff, on public houses, it even featured in at least 2 paintings in the B&B. We arrived at our nights stop for about 8pm. We stopped at DalesHaven in Leyburn and it was fantastic, more of a hotel than a B&B, BIG spacious rooms, with better than home washing facilities and the first B&B to offer porridge! (as well as a huge array of other breakkie stuff) highly recommended! Landlord by the way, owned a carbon Felt bike by the way, so he must of been fit around these hilly parts. Following day, was our shortest cycling day. We had a bed for the night with my baby brother, who lives in the village of Silverdale. It was just 55 miles out of Leyburn. We cycled again through the most stunning of hillsides, I filmed more than I photographed, but for some reason the Dogcam did not pic any of it up? Our route went along the Arnside Audax ride, and down the into the Ribblehead valley from Hawes, Askrigg and Leyburn. Tina at the highest point of the ride. Was washed out. She was wanting to phone someone, anyone, a Taxi maybe to get a lift the last 30 miles. I managed to coax her to the Ribblehead Station, where I knew we could at least rest out of the very cold head wind. My brother wasnt too far away – he works in Lancaster. It was now 3.30pm and we could if necessary sit and wait for him inside the pub. They sell really good homemade food in the Ribblehead Station pub. And do a really fabulous looking cheeseboard too... Anyway, we had soup, and it was proper stand your spoon up stuff, well flavoured too. After sitting for an hour, and having lots of tea as well, Tina felt strong enough to venture out again and try the last miles. I did point out at least, should Ali come to get us, we could cycle as far along as possible. The last 30 miles were also far far less hilly. We set off and although we cycled slowly, it wasnt long before the signs to Carnforth were coming thick and fast. We finally made it the last 4 miles to Silverdale. My brother was most welcoming, and we were chuffed to get to his house. We made the distance. I am very pleased for Tina, it was her first big challenge, big cycling adventure, tour and experience of long distance cycling. CYcling just 40 miles a week to train, she was an inspiration. Weather – Fab U lous, cept the cold head wind on the way home. Finally, we had this picture taken of us both at the Start again of the Way of the Roses, or in our case the start and the finish having completed the loop. Tina and I just before a somewhat choppy crossing on the 'Ben' going home. My next big tour is THE big one in July. Posted by Mary on April 15th, 2011. Wonderful stuff Mary. Congratulations to you and particularly to Tina , 360 miles in 4 days is a lot of cycling by anyone's standards. You look to be thoroughly enjoying yourselves despite the inevitable low points and the rotten luck (altho fairly typical I suppose) of having a headwind in both directions. I loved the video (I thought the music went well with it too), its not BBC standard but thats not the point. Such technical wizardry is well beyond me. It looked a smashing ride and a great adventure. Well done to you both. We did have fun. We were lucky with the weather as well, wind was bad, but we had no rain as such just a shower on Monday. LOL Tina, you do get over things quick! And yes, Druidale on Good Friday... Bring an Easter Egg! Chris, I must thank you for the warning about Settle Hill, it was I think the biggest single climb of the entire ride, and we both walked on tippee toe shoving the bikes up hill. The first part of the Video is on Settle Hill. It was indeed a good tour. I intend to return to Leyburn, and use that as a base for other long rides, it was such a beautiful part of Yorkshire. Here is a bit I found out about that white horse. 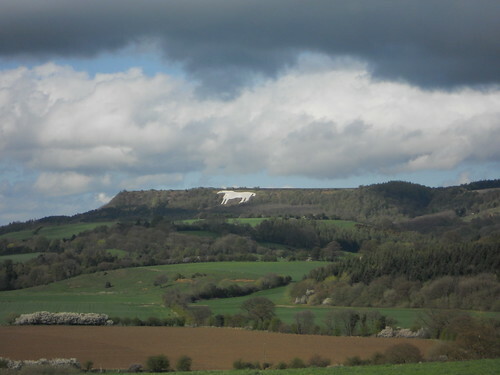 Its called the Kilburn White Horse. Mags, any time, you know where I live! See you at the party to sort out a trip. Mary and I have thought up a little cheeky plan that may just suit you. All will be revealed in good time. Can anyone tell us what the carving is at Flamborough please? Great achievement both of you, but especially Tina. 360 miles in 4 days, wow. Congratulations! Yes, a great ride and a great report. Well done both. You have a lovely way of describing your trips Mary. And Tina of course is a heroine. Was a shame about the headwind but better than rain. You picked some splendid accommodation by the sound of it, plus a fine return route. Mary wrote: I filmed more than I photographed, but for some reason the Dogcam did not pic any of it up? The DogCam takes a bit of getting used to. If the battery hadn't run out, perhaps the card was full, or the cam had switched itself off. I don't think it matters as the photos tell the story well. Most enjoyable. I'm not the best-qualified person to comment on what to take on a cycle tour. 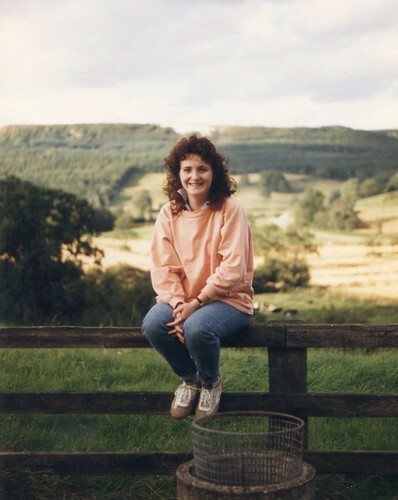 The kit on my last one – a short tour of the Yorkshire Moors and Dales – included a pair of chain whips, a complete wardrobe of walking gear (including boots) and a leather-bound copy of Brideshead Revisited still in its presentation box. Oh, and a 'D' lock and cable. Just watched your video. Nice to see so many familiar sights, although I strugged to place some of them. I presume at 1:49 you were going along Thorpe Lane near Grassington? We kept an eye out for you both last Sunday, and thought we might bump in to you on NCN route 1 between Driffield and Bridlington. But I see you used the main roads (I hate that one on your return leg between Malton and Hovingham) and avoided the Bridlington coast all together. Missing Bridlington is no bad thing, I suppose, especially if you are going to Flamborough anyway. We rode along the designated track between Sewerby and Bridlington near the cliff edge. Steve rode on the grass to avoid the people walking four abreast who wouldn't easily give us a little space to squeeze past. I'm sure Leyburn was lovely, but can I put in a plea for Askrigg as a place to stay in the Yorkshire Dales? You simply have so many more options riding out to the north, south, east or west: you can easily avoid those main roads near Leyburn, but still go there as part of a day ride if you want to. 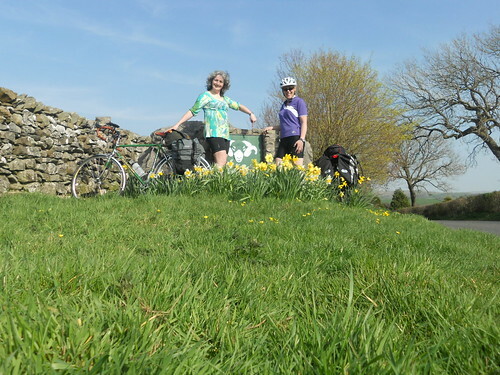 (Read my plug for a cyclist-friendly B&B in Askrigg.) If you like all things Herriot, you might want to visit the King's Arms in Askrigg: it doubled as the "Drovers Inn" for the TV series. Oh, did you enjoy the gentle climb between Pocklington and Huggate? (I also like the quiet road between Huggate and Kirkburn – not spectacular, but just pleasant and rarely busy). Millington Dale – between Pocklington and Huggate – is like a mini-Thixendale – somewhere you will have to go to if you ride in the Yorkshire Wolds again. I fully intend to return to this region of Yorkshire. It was stunningly beautiful. Its on my visit again list, perhaps next year? And yes, the Malton part was a bit – industrial. The B road we were on, was busy, but it wasnt madness at least. A bit like some roads back home in rush hour. There is the thing, when you do your planning, you dont know how busy roads are until you ride them. It also rained here, which made it a bit extra miserable. It wasn't supposed to be our route. BUt I had to make some adjustments to take a more direct road back to Carnforth and save some miles. Sadly we did miss you, as we had the HORRIBLE A road into Brid to cycle. Eyes down, wheels turning. We were glad it wasnt an Easter Bank holiday full of beach traffic! How absolutely fantastic, it all looked so much fun and so beautiful.Really enjoyed reading your blog. Well done for such a long ride! Congratulations, Mary (and Tina of course). What a great ride, and with great weather to boot. The video definitely has Oscar potential. What a great ride, one I would love to do as a double crossing in August. Great video and pic's, not forgetting the interesting write-up.